Now that fall is clearly in the air, we are thinking about celebrating Thanksgiving with family and friends. We would like to share some ideas for some beautiful Thanksgiving tablescapes. We don’t believe there are any boundaries when creating a holiday table to fit your own personal tastes – whether they are casual and fun or sophisticated and glamorous! Here are just a few of the many tablescapes we have seen and loved. You can’t go wrong with a neutral palette – this one by Martha Stewart is soothing and natural. This one from Good Housekeeping is elegant, simple, and inexpensive. 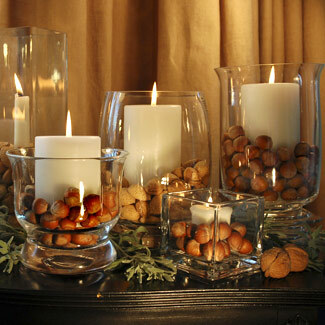 Filling glass candle holders with natural elements such as the nuts pictured here could not be easier. Or, swap out the nuts with pinecones, mini pumpkins, or gourds for a different look. Last, but not least, we love this tablescape from Country Livingwhich expresses the sentiments of the season in such a beautiful yet simple way. Let’s all give thanks in style this year.